Across the entire breadth of New York State, undeviating, a hilly strip scarcely twenty-five miles wide invites the world’s wonder. It is a broad psychic highway, a thoroughfare of the occult whose great stations number the mystic seven. For where, in its rolling course from east of Albany to west of Buffalo, it has reached one of seven isolated and lonely heights, voices out of other worlds have spoken with spiritual authority to men and women, and the invisible mantles of the prophets have been laid on consecrated shoulders. In my mid-twenties a wise friend, recognizing the tenor of my love for my home state, suggested I read Carl Carmer’s 1936 book, Listen for a Lonesome Drum: A York State Chronicle. 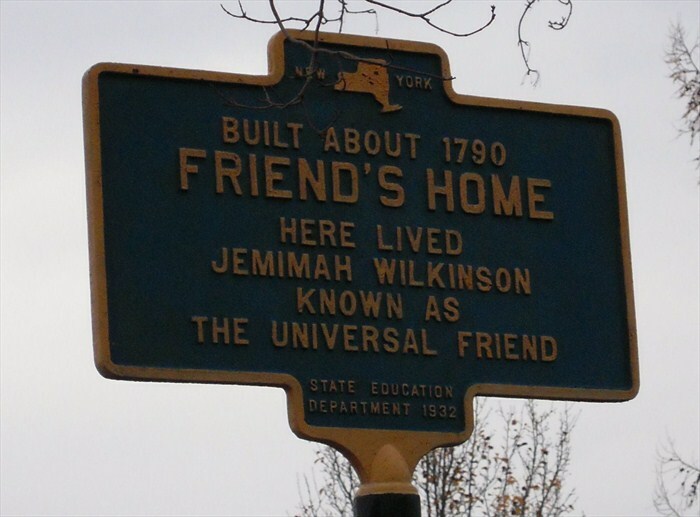 There, in the chapter “The Woman Who Died Twice,” I first learned of Jemima Wilkinson, also known as the Universal Friend, a spiritual leader in late-18th and early-19th century Western New York. Because I grew up in places not very far to the east and west of where she built her community, and because I identify that part of the world as home, Jemima Wilkinson’s amazing, strange story has a special fascination for me. Early on in my infatuation, I began a long poem on the Universal Friend—having in mind something like Kenneth Irby’s “Jed Smith and the Way” or those parts of Charles Olson’s Maximus Poems that deal at length with figures from Gloucester’s past—but decided not to continue work beyond the research and notes stage. Until fifteen years later, when I was writing The Mornith War. The Universal Friend had stayed with me all that time, and I found myself translating the person I had imagined through a historical perspective into a character of fantasy, and the figure around which the story revolves: Mary Tammer, the Prophet of Free Farm. This entry was posted in Fantasy, Place, Poetry, Sources, Winnitok Tales and tagged Carl Carmer, Charles Olson, Free Farm, Jemima Wilkinson, Kenneth Irby, Listen for a Lonesome Drum, Mary Tammer, Mornith War, Public Universal Friend, The Maximus Poems, Universal Friend, Western New York. Bookmark the permalink.